Visit Pace Software at AAPEX 2018! Going to Vegas? Pace Software will be exhibiting at AAPEX 2018 from October 30th to November 1st, joining more than 106,000 professionals from around the globe participating in Automotive Aftermarket Industry Week in Las Vegas, Nevada. 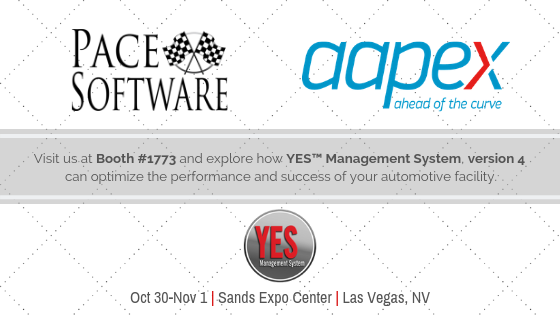 Don’t miss the chance to meet one-on-one with our product specialists and explore how you can streamline operations, increase revenue and improve customer retention for your automotive repair shop with Pace Software’s YES Management System. If you'd like, you can request a meeting to schedule your one-on-one consultation ahead of time! Whether you’re a single shop or a multi-location service facility, the YES Management System is the solution designed to optimize the performance and success of your unique business. Please stop by AAPEX at the Sands Expo Center and visit us at Booth #1773.